Flexo vs. Digital: Which is Right for You? Are you struggling to decide whether flexographic (flexo) or digital printing is best for your labeling job? You’re not alone. And while there’s no one-size-fits-all answer, Jet Label will help you determine which print process matches your needs. Both flexo and digital bring their own set of benefits and limitations – pluses and minuses that, when quantified, yield the right answer for print jobs of all sorts. We work closely with customers to determine the most cost-effective means of producing quality, impactful printed products in a timely fashion. Nice speech. So… which is better? The differences between flexo and digital – and there are several – may make one more suitable to a specific print job than the other. But over time, as your needs expand or evolve, these differences are often complementary – in other words, it may make sense to use flexo for one job and digital for another. So it’s smart to work with a company (like us!) that offers both. OK, so what are the basics? 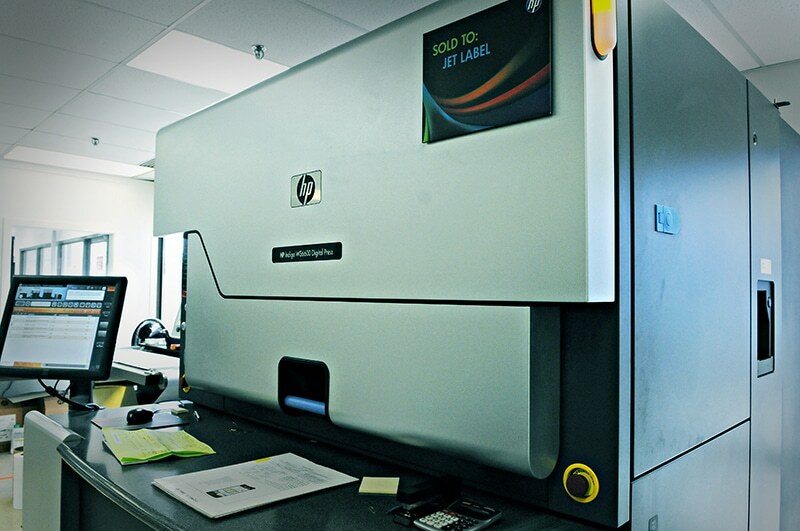 Generally speaking, digital printing is ideal for shorter runs requiring quick turnaround. It’s also ideal for sampling, or for jobs where variable data – a.k.a. “versioning” – is required. Flexo is typically preferable for longer runs – and when your labels require enhanced durability. It’s super-fast and ensures great colour precision. By and large, flexo is more cost-effective for runs longer than about 5,000 feet. What are the differences in terms of technology? Flexo printing uses printing plates made of rubber or plastic rotated on a cylinder and coated with fast-drying ink. It’s often used for product labels and direct thermal labels, which are passed between the print plate and impression roller. Digital presses forgo plates and impression rollers entirely, depositing toner directly onto the substrate. Using heat, the toner forms a thin layer on the surface rather than permeating the material. What are the benefits and drawbacks of each? Limited up-front costs & set-up time: Since there are no plates to create or images to distort, setup time is minimal, leading to lower costs and faster turnaround for short runs (less than 5,000ft). HD Quality: Digital printing can produce high-resolution graphics, primarily because printing is performed in unison rather than in layers. Changes are simple: Digital is highly flexible — labels can be changed and updated quickly and easily, allowing for variable and even customized products. Higher per-item cost: The cost to run large print jobs can be high, as labels are more expensive to produce individually. Less durable, fewer substrates: Labels produced digitally usually aren’t designed for especially long shelf lives, and shouldn’t be used outdoors. And since digital presses use a heat-sensitive process, it can’t be utilized for certain materials. Less turnkey: Additional steps – laminating or cold foil applications, for example – require additional processes and time, since they are performed separately from the original digital print process. Long runs at lower cost: Flexo is cheaper for large print jobs (5,000ft or more). Lightning speed: Setup takes some time, but once flexo presses get going they really get going. Oh, the colours! Flexo allows precision colour matching through the industry standard Pantone Colour System. Versatile & Durable: Flexo printing can be used for virtually any material, and can produce labels rugged enough for long shelf lives or outdoor use. Turnkey add-ons: Laminating, die-cutting, cold-foiling and other process can be easily integrated into the press line, making production continuous. Up-front cost: Flexo requires sizable front-end costs, including producing printing plates for each colour in your label’s artwork. Set-up is another significant investment, and has its complications and challenges. For example, since wrapping an image around a cylinder causes it to stretch and distort, the image itself must be distorted before the plates are created to ensure proper printing. Beautiful… but not quite HD. It’s an odd, often confusing paradox: Though flexo generally produces more precise colours than digital, the resolution of the overall printing process is a bit lower. The reason is registration – the ever-so-slight sideways movement as labels move between plates. But unless your job absolutely requires high-resolution printing, you’d never notice the difference. We will help you figure out whether flexo or digital is ideal for you. Together, we’ll consider each of your requirements and agree on the best-possible solution. Thanks to years of experience with customers large and small, the experts at Jet Label are well positioned to help you make this important decision wisely.